Our bodies need both of these building blocks and they can only be derived from food, however, the key is how much of which for a healthy balance. 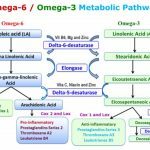 The balance is significant because some omega-6 tends to cause inflammation while omega-3 reduces it. Chronic inflammation in the body leads to all kinds of adverse reactions besides simply pain: heart disease, stroke, arthritis, diabetes, cancer, and more. Scientists and nutritionists vary on the optimal ratio of omegas—the range is 1:1 to 4:1 of omega-6 to omega-3. In the North American diet, the typical ratio is 16:1. That’s bad, by any standard. What this means is that inflammation can run rampant and do its nasty deeds. Omegas are critical for brain, skin, and hair growth and development. 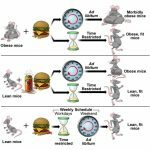 The dominance of omega-6 fatty acids occurs as the result of increased intake of processed and fatty foods—along with an excess of animal fats—and the decrease of foods containing omega-3s to counteract them. The answer to balance, of course, is not simply to eat more fats that contain omega-3; be mindful of what you’re eating to reduce the omega-6 and make sure you’re getting enough omega-3 and you’ll meet in the middle.